All those who roast coffee, and most of the sellers, taste the final product in what is known as “coffee cupping / tasting.” As with a real wine tasting, coffee is not swallowed. When tasting the coffee, simply slurp it, spreading it in the mouth to observe the whole variety of aspects, then remove it from the mouth in a container located nearby. Expert “tasters” begin by frying a small batch of coffee beans. Then they grind the beans and put them into a cup. 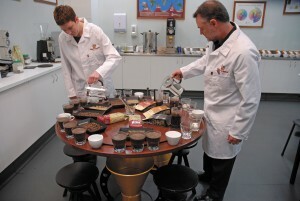 Next, they pour hot water over the ground coffee and they start by observing the aroma and then by tasting the coffee. Expert coffee tasters never swallow the coffee they have just tasted because this would diminish the acuity of their taste buds. Tasting coffee is an art. 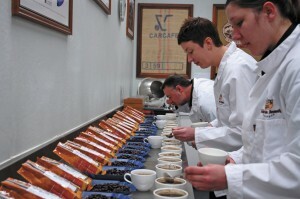 Tasters must taste between 15 and 20 types of coffee a day, without losing the distinctive qualities of any of them. Because taste is a personal thing, there will never be two tasters to completely agree with each other over the final product. The coffee tasting ceremony has become more scientific. Machines were invented to help the tasters to perfect their art and to ensure product continuity. Agtron is an electronic machine that measures the color of ground coffee after roasting. Gloria Jean’s sets a roasting standard for each type of beans, and each batch is measured accurately. After the coffee is packed in valve bags, in order to maintain freshness, the oxygen levels are checked twice. The first verification is done the same day the coffee is roasted. The second verification is done the following day. If the oxygen level increases, it means that either the bag was not sealed properly, or that the unidirectional valve does not work properly. If, on a second check, the oxygen level is lower, then the coffee will maintain its freshness 12 months thereon.